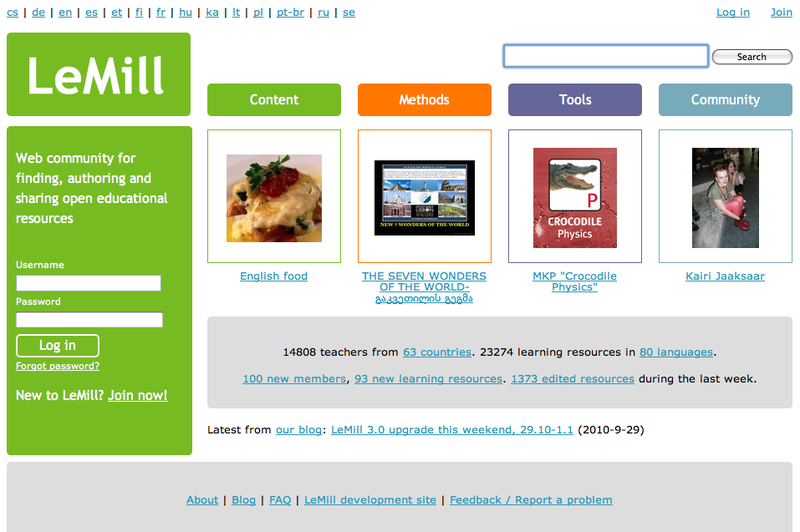 We just released a new version of the LeMill service — web community for finding, authoring and sharing open educational resources (OER). I think our design with LeMill is finally getting the right shape. I think it is better if I do not explain the design, as the service is just a click away. Feel free to try it. I am, however, pretty convinced that the interaction and usability design of LeMill is better than in any other OER repository today. It is also worth to mention that LeMill is not only OER repository, but a wiki — a collection of content that anyone can edit. LeMill’s user interface is clear, fast, minimalistic and beautiful. LeMill community is still relatively small; close to 15 000 teachers. The small size of the community causes challenges, especially as it is divided to 14 language communities. The good news is that we now have friends in Brazil and the user interface is translated to Brazilian Portuguese. With the fast growth of Internet connections, commitment to Open Source and investments to education we may expect some growth in Brazil. That is good. What I would like to see in LeMill would be more teachers from the US, Canada, UK, Australia, New Zealand and other English speaking countries. I think the low numbers from these countries have an effect on the growth of LeMill in other locations, too. People everywhere read English online media and today LeMill does not make the headlines.